A few years ago I got a message from a nice young couple that had worked their way through each and every recipe in Room for Dessert, my first book, and wanted me to sign their copy. And let me tell you, these kids were really pioneers, as this was well before the “cook every recipe from the book” blogs got so popular—they didn’t even have a blog! When I met them, the book was filled with bookmarks and stains of all sorts. Obviously well-used, they really didn’t even need to tell me that they’d made everything in the book. But they did confess that the only recipe they couldn’t make was the candied citron, because they couldn’t find any citron. I feel their pain. 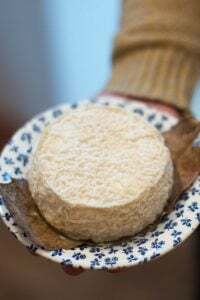 I was going to make panforte (Italian fruitcake) this year and I looked all over Paris this year for one and couldn’t located a single, solitary cédrat, no matter where I looked. (And I’m scared to use those greenish pieces and strips sold in containers.) My constant refrain is that you can get everything you want in Paris—except what you’re looking for. I scoped out specialty produce places, outdoor markets, and the Jewish épiceries. You name it, if there was the possibility of finding a citron in there, you can be sure there was a strange American fellow in there trying to explain to them what a cédrat was. But I guess I shouldn’t complain about a country where you can find foie gras in natural food stores. Last week I was over in the sixth for a doctor’s appointment and walked past Hédonie (6, rue de Mezieres). On a whim, I peered through the window, and spotted a lone Buddha’s Hand citron resting in a basket amongst a pile of grapefruits. Of course, it had no price on it (that seems to be another truism about Paris—the one particular thing that you want to buy is the only item on the shelf that doesn’t have a price on it, prompting a “price check”, which here can range anywhere from five seconds to a shrug of the shoulders), but the lovely saleswoman put the lone citron on the scale and pressed a button marked agrumes Bachès, and it spit out a price of just over €5. I hemmed and hawed for a few minutes then dug the heels of my cheap skates into the ground and bought it. People have asked me to put in recipes the time it takes to candy fruits. But that’s like asking someone how long it takes for water to boil. 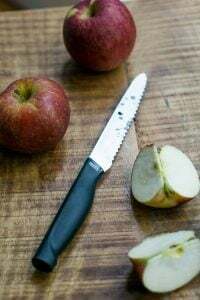 It’s pretty difficult to gauge, and no one wants to ruin a hard-won piece of fruit, so an inexpensive candy thermometer, which are available at most supermarkets, cookware stores, and even hardware stores, is the best way to judge when fruit is candied. 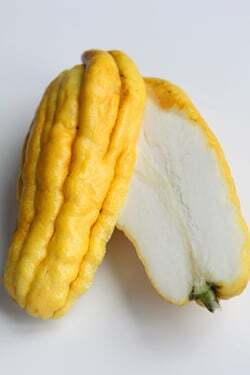 The two most common citrons are the Buddha’s Hand, with elongated tendrils, and the Etrog (or Esrog) citron, which resembles a big knobbly lemon. Be sure to buy one from a source that doesn’t spray their fruits or raises them organically. One 8 ounce (240g) fresh citron will yield about one cup (250g) of candied citron pieces. You can scale the recipe up or down accordingly, depending on how many citrons you have. I don’t recommend candying more than four citrons in one batch; if you have more, preserve them in subsequent batches.Many are likely to inquire if the corn syrup is necessary. You can leave it out but it does prevent the citron pieces from crystallizing and keeps them moister, which most other liquid sweeteners do not. 1. 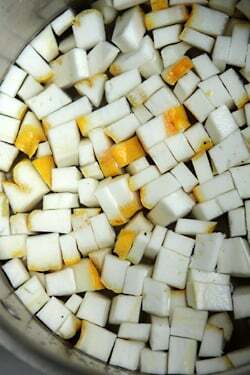 Wash and dry the citrons, then cut them into 1/2-inch (2cm) cubes. 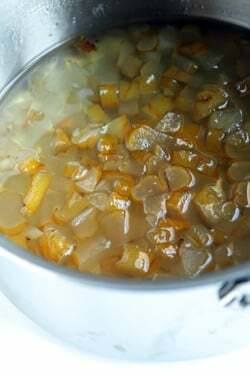 Put the pieces in a large saucepan, cover with a sufficient amount of water so it won’t boil away, and blanch the citron pieces in barely simmering water for 30 to 40 minutes, until they’re translucent. 2. Drain the citrons, then put 3 cups (600g) of sugar, the 2 cups (500ml) water, and the corn syrup (if using) in the pan with the citron pieces. During the final minutes of cooking, if the citron pieces are sticking to the bottom of the pan, gently stir them from time to time with a heatproof spatula or spoon to prevent burning. 4. 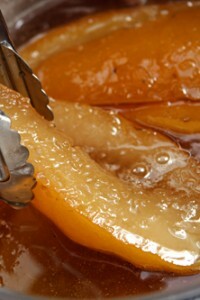 Once done, turn off the heat and let the citron pieces sit in the syrup for one hour. When done, toss the pieces of citron in sugar and let sit on a wire rack overnight to dry out. Then shake off the excess sugar, reserving it for another baking project, like lemon curd, marmalade, or ice cream. Storage: Store the citron pieces in a jar at room temperature (if planning to use within a few weeks) or in the refrigerator, until ready to use. 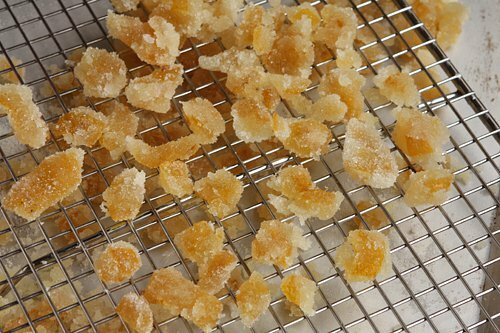 The candied citron should last up to six months. It can also be stored in the syrup, as indicated in step #5. Troubleshooting Tip: If too much sugar clings to the finished peel, you either didn’t let it cook enough, didn’t drain it long enough, or the sugar was too fine. Depending on where you live, use the coarsest granulated sugar you can find. 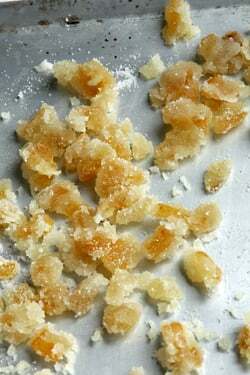 Cooking in France Tip: Granulated sugar in France is finer than sugar in the United States and will dissolve more readily when tossed with the just-candied citron. 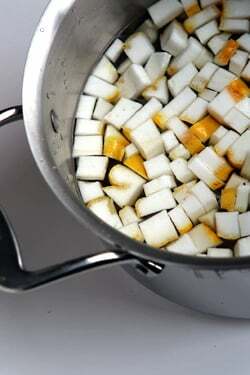 Be sure to use the coarse sucre cristallise rather than sucre semoule. It must be an awesome feeling to have someone admire your work so much so, that they are willing to invest so much time, energy and $$$ to such a monumental task. Congratulations, David. The best time of year to find am etrog is late september, as that is when they are used for the Jewish holiday of succot. If you can’t find them in Jewish stores at that time, you can usually special order them. Thank you for this recipe- I was always told that you ‘can’t’ eat buddhas hand and etrog. You should’ve smuggled out the Buddha’s hand you had on display in Austin. I went down to the produce section after class and priced the “hands” and was sticker shocked! They were $11.00! I went home without one since I didn’t really have a use lined up for it. Nice to know they are just as “cheap” in France. Sarah: I’ve actually seen recipes (or instructions) on slicing a raw citron, sprinkling the slices with sugar, and eating them raw. I haven’t tried that and they don’t sound that appetizing, but perhaps they are. Or maybe they use a variety of citron that’s more palatable? 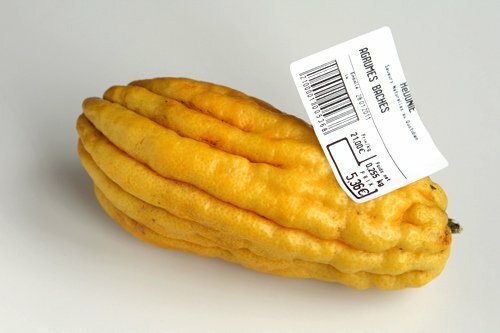 Delia: I was actually going to bring an Etrog citron from Central Market back to Paris since they were only $5.99 each, and a little easier to pack that those wild-looking Buddha Hand citrons they had! But for some reason I didn’t. They were a lot heftier than this one, so I’ll just have to go back to Texas next year with a bigger suitcase. I’ve never seen it homemade before! I must print it out for her. It’s always interesting following you blog. Thanks for sharing all your knowledge! I remember walking down the Rue des Rosiers around sukkot about 10 years ago and seeing guys selling citrons on the street. At Christmas we allways make German Stollen and use store bought candied peel. Now I must find this fruit in the Netherlands, I’ll take a note in my calendar for september/october, and make my own candied citron. We normally buy the ready made ones in our Asian Supermarket. That’s were this tree originates from. Hmmm… I am trying to think of a drink I could make with vodka which would use the candied citron. Thanks for the recipe ! I *love* that idea! I’d be happy to pick you up curbside and take you to Snow’s barbecue, voted number one by Texas monthly. That way you could say you’ve had the top three in the state! I wish I could have brought citron back from the south of Italy last time I was there. There were plenty of them at the stores! Clearly I need to head down there earlier in the season next year! I am delighted you could finally find a citron after such a wide search but would never have recognised it in this shape. I am more used to the over large and sometimes slighty grotesque lemon shape, with a citrus pulp too. Thanks for introducing me to citron and showing a way to use it. I’ve learned so much from your blog. Recently I saw citrons at Central Market and wondered what in the world…. Now if only CM would get some celery root — they have been out the past few weeks and say they are having a hard time getting them. 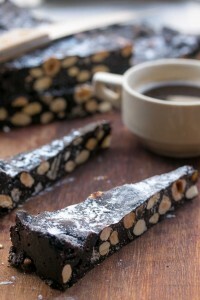 Which of the panforte recipes are you going to use? I have made Tartine’s (Wednesday Chef’s). I would love for you to share your version. Acitrón is Mexico’s version of citron. It is candied biznaga cactus, used in many traditional recipes, such as chiles en nogada. Mexico also candies limes and calabaza, a huge squash. I find it interesting that each country candies whatever is available. What a Cypriot Coincidence! I had never even heard of Buddha’s hand until dining in Cambridge, MA at a new restaurant called Bondir that had it accompanying one of the desserts… It was delicious, now I just need to find an organic one somewhere… wish me luck! Thank you David for another amazing recipe – you are the greatest. Ahh, such a timely post. I bought two huge Buddha’s Hands at the farmer’s market in San Diego for only $3.00 each! After letting them perfume my apartment for a week, I sliced them up for marmalade this morning. They are now simmering away on the stove, making my whole place smell wonderful. The farmer who raised them was justifiably proud (they were beautiful, unblemished and organic). Must be frustrating for him, as most people just look, say “What the hell is THAT? ?” and walk away. I mentioned to one lady that they are used as a sort of air freshener in China and Japan, and she looked at me like I had just popped an alien out of my chest. BTW, I have made your celery root soup many times for my dear friend who is 92 years young, and he says it’s the best soup he’s ever had. He’s lived all over the world, including Paris, so he doesn’t give out praise like that lightly. 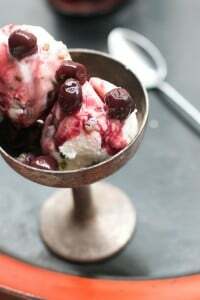 Thanks for a great blog and all the wonderful recipes. Following a successful recipe I had used for candying orange and lemon peels, I blanched the citron three times for 5 minutes each time. I discovered too late that the bitterness remained. Your instructions to boil the citron for over a half hour certainly makes sense……NOW. My citron did have some lemon-like flesh in its centre of very thick pith. Your example seemed to be all pith! Did the pith shrink after the 30 minute blanching or did you discard most of it while cubing the citron? I look forward (?) to next year’s crop! I wish I had seen this before! I had two of these buddha’s hands and no clue what I was going to do with them! So lucky to find them at your little épicier. On the Greek island of Naxos they make a liqueur called Kitron from this fruit. It’s served everywhere there, but it’s extremely difficult to get anywhere else, even in Athens, as the family-run distillery is averse to marketing it beyond Naxos. It’s delicious and if you can find some I wholeheartedly recommend it! My mom always struggles to find citron, but candies oranges and I love them. I can only imagine what these would taste like. They look delicious! Cedrats grow in Corsica. Maybe you can try asking in a Corsican store. They make jam and perfume with them also. Thank you for the recipe. I’ve got October marked on my calendar–candied cédrat is delicious! One of my favorite perfumes is Guerlain’s Eau de Fleurs de Cédrat. Sometimes I feel like drinking it, but this time I’ll try to wait it out for another 8 months. Mm yes. I must look for those. Thank you for the tip on when to find it and also the sugar advice. Boy, do I feel like a dumbell……all this time I thought that candied citron were candied lemons…. *reaches for duncecap*. Thank you for the education. Around Succot, if you gou to the area around Faubourg Montmartre, rue Richer, you’ll find Jewish kids selling citrons on the street – a bit like the sale of muguet for the May Day holiday . David have you ever had Etrog jam/preserve? it’s delicious! growing up we use to make it at home every year after the jewish holiday, Succot. This post brought up sweet childhood memories, thanks! Looks and sounds perfectly lovely…. We do get beautiful candied ginger in Colorado at Whole Foods (ok, I’m lazy) that sneaks its way into my ginger cookies, gingerbread cupcakes with cream cheese-coconut frosting, etc. Yesterday, as I was cleaning out the baking larder, the box dumped (OH NO! ), though only a couple of pieces hit the floor. A bar of Valrhona chocolate fell beside the ginger and I began to think of chocolate chip cookies with candied ginger. All because of a post you did (whenever?) with pics of chocolate being chopped for cookies. Going to try it. Thanks. Five euros for a Buddha’s hand–aiyaiyai! Hope it was worth it! I’ve been wanting to candy a Buddha’s hand whole ever since I saw them done like that in Japan a few years ago–finally got around to it last week. I simmered it until tender and then brought it to a boil with 4 parts water to 1 part sugar and let it sit overnight. Each day for 5 days I added another half-part sugar, brought it to a boil and let it sit overnight. I took it out of the syrup to dry (though it would probably look pretty cool sitting in the syrup)–I wanted to let it age and get the gorgeous dark orange color of the Japanese ones but a friend came over for tea and somehow it all disappeared. I didn’t even get a chance to take a photo! Oh well, there’s always next year. Oh, sheesh! Who knew citron and the Buddha’s Hand were one and the same? Thanks for the valuable lesson. The Buddha’s Hand always creeps me out. When I saw the photo I immediately scrolled, looking to see if you would call it that. How can something so Vincent Price-esque end up being so tasty? Thanks for the memories… again, David! 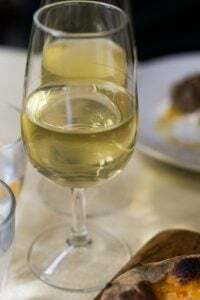 My husband and I spent October in Southern Italy, and our favourite place we stayed at was in the Puglia region at Il Frantoio, an organic olive oil farm. Our room was surrounded by an enclosed orangerie grove that included citron trees that were hanging heavy with ripe citron. We enjoyed homemade citron preserves at breakfast as well as homemade citron rosioli (digestive) after dinner. Such a beautiful specimen it is! If one can obtain citron, it is definitely worth the work to preserve it. People just use them here to fragrance a room, as one poster mentioned. I know of one person who makes a marmalade but he never said the “c” word. 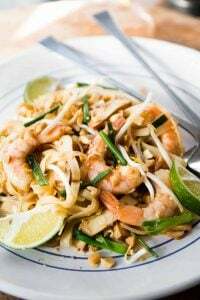 You’ll probably end up with your own Food Network special from this post. You should, anyway. Well I’ve learned something new today. I’d never heard of a citron – I just assumed it was French for lemon. Thanks for enlightening me. I don’t think I’ll find one in Dubai but you never know! Oh brilliant! It looks like candied ginger, which I dislike, but isn’t candied ginger, so I’m keen. Hurrah! I think you meant 110˚C and not 100˚C in step 3 of the recipe. Just wanted to drop a line to say I freaking LOVE your writing. This put such a smile on my face. You are the best Lebovitz! That fruit is unusual, but beautiful. I was also under the impression that “citron” was French for lemon or lime, so Vicki, you are not alone! Recipes like this always make me wonder about the history of the food. Who invented candied fruit – and who decided that this aromatic tree fruit with so little to no pulp would taste good candied? Humans are remarkable. I was beginning to believe that citron was a figment of our imagination. So lovely. Thanks for sharing. Clarify something for the dunces among us- does your recipe call for using the peel only? Also, if one does not have access to citrons, what modifications are necessary for oranges or lemons, if any? Finally, can the sugar water be re-used for subsequent candying, or must one start from scratch every time? Melanie: I use my recipe that’s in Room for Dessert, but the recipes I’ve linked to (available online) look like good ones, too. Steve: You use the whole fruit; pith, peel and all. There’s very little liquid left, maybe 1/2 cup (125ml) which I wouldn’t recook as the sugar syrup can take on an undesired caramel flavor. I’ve not used this exact method for other citrus fruits since citrons are quite different and likely it wouldn’t work for them. But if you do try one, let us know how it works out. Lisa & Vicki: Citron is the French word for lemon, hence the confusion for some people. Vielleanglais: I think I definitely need to get an earlier start next year in my search! what a lovely, lovely post this is, charming, touching, interesting (as always) and stopping me from work (always welcome too!)…. Feel like an espresso with a slice of a lemony cake now, oh zut alors à me tenter de cette façon! Hi David,i love your blog I even use your e-mails to teach english converstation with my students because it´s full of vocabulary they´ve never heard!!!!!!! I think you can find those citrons around september or october for the sukhot festivities,in some jewish supermarkets. Agrumes Baches are quite literally http://www.agrumes-baches.com/ , a nursery near Perpignan with a wonderful selection of mainly hardy citrus trees. I grow a few of theirs plants myself. 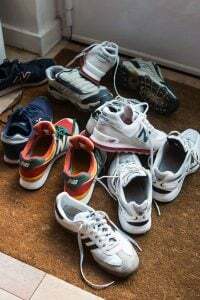 “dug the heels of my cheap skates.” Love it!! in college, i worked at a greenhouse that grew buddha’s hand, which i was always tempted to steal. the woman who ran it told us the fruit we grew there shouldn’t be eaten, but i think she said that just to keep in all to herself. this looks gorgeous. i’m definitely interested in candying something now. There are several of us farmers in California who are growing citrons – both types. Specialty green grocers should be able acquire them from their California sources. Best time to buy is after the Jewish sukkot holiday, beginning in late October, continuing to about mid February. I loved this post. I use citron when I make Neapolitan pastiera at Easter time and I have recently seen this variety of citron here in my area. This homemade candied citron will certainly perfume my pastiera in away the commercial kind could never. I must say, though, that when I am in Florence, the citron is never as expensive as in Paris. I’m motivated to make it next time in am in Florence. I’ve never candied citron but its definitely been added to my list! In regards to the corn syrup crystallization issue: The Tartine Bakery cook book suggests cream of tartar and lemon juice in place of corn syrup to prevent crystallization. 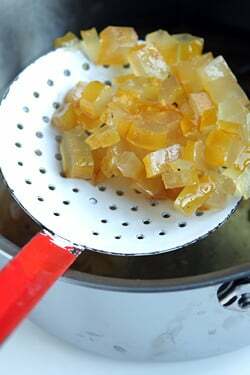 I candied some meyer lemon zest using this method and it worked wonderfully. I’m not sure if that can be applied here but its worth a shot. I have been bitten by the Buddha hand bug! I wanted to make candied citron for mincemeat for next year. Found one at Whole Foods ($6.99), found a recipe on-line, and now have about 3 cups of candied citron. Then I bought another one and started infusing it in vodka for an liqueur. Next will be marmalade or sorbet, if they are still available. Chantale & Jay, the "nice young couple"
That’s us! You’re talking about us! Very cool to be featured in your blog. We’ve gotta admit, we’d been dreaming about this our whole lives (or at least in 2002 when we first bought your book on Amazon). We dedicated every Sunday to do three of your recipes at a time and your name became a house hold name. “Dave wants us to smash anise with a hammer in a baggie!” or “Dave wants us to use concord grapes? What are those? These regular grapes will probably do” (that Concord Grape Jelly recipe was obviously a fail). 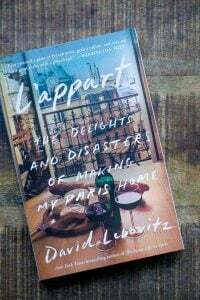 When all three recipes of a Sunday were a success, we’d call it a “Lebovitz”. When it was a Lebovitz, it was a success. (We only got a Lebovitz a handful of times). And when we did succeed, we’d fantasize about meeting you, so sure that you’d fly us out to San Francisco to meet us and put us on a talk show. So thank you for meeting us that one day. It was a fateful day for us. And may you always think of us whenever you pick up a citron. We’ve just uploaded a photo of us and our first citron on your facebook. It was the lucky citron that helped us finish your book. If I ever get a show, and have an episode on candying citron, I will do my best to have you both on it. And it was nice to meet you both to, even though you’re just “friends in baking’…my kinda people! I wanted to make a pannetone for my boyfriends Italian family for Christmas but I couldn’t find candied citron or even citron anywhere! My boss mentioned that they probably would sell them at asian markets, like Uwajimaya in Seattle. Anyway I’m so glad you posted about this! No way! I’ve finally found the excuse I needed to get a Buddha’s Hand tree. I did not know it was a kind of cedrat. I’ve only ever seen them decorating altars at pagodas…but candied citron? Sky’s the limit! What fun–and thank you for this! David…I am faced with a lot of leftover seville orange peel..and want to candy it. 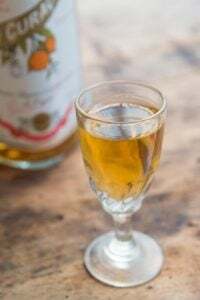 Could one substitute a quarter cup of seville orange juice for some of the water in the candying stage to give it more flavor or would that prevent the syrup from getting to the right stage without burning? Just a thought…thanks for sharing so many great ideas on your site. HI Larrian: I would be wary of cooking citrus juice too much since it can become unpleasant and bitter (even more so than normal Seville oranges are). Plus I would imagine those peels would be pretty bitter on their own without the additional juice. You might want to try the Seville Orange Sorbet that Keiko made with that juice perhaps. Good luck! Margaret: Am not sure they’re something one would see in an Asian market, in spite of the name, but they do turn up in unlikely places so it’s worth a try. I read this post and the one on citrus but did not make the connection until now. On January 26th Sotheby’s sold a wonderful painting attributed to the Renaissance artist, Giovanna Garzoni entitled “Lemons”…. not lemons but Buddha’s hands. If you look on artdaily you will find the image. Garzoni painted lovely still life images full of fruits and vegetables that are utterly charming. Citrus geek here…….. So… finding citron is a problem, other than the Buddha’s hand which is so “in” right now. I am experimenting with growing 2 other kinds here in Los Angeles, from seeds I got from the big collection of 1000 or so varieties of citrus that is maintained by UC Riverside. According to David Karp (the fruit detective) the two primary kinds of culinary citron are the Diamante and the Dulcia, both from Italy. Those are the ones I am growing and have a few small fruit on them for the first time. These are not available as plants in the US and starting them from seed is risky. With some citrus you will get true to type and with some you won’t but I am anxious to see if I get anything with a strong and rich citron fragrance. Next time your in Italy in citrus season poke around, although I think even there they may be hard to find. David, I finally found a Buddahs hand at Central Market, and made this tonight. The lemon flavor was strong but not acidy it was really nice. Not sure how to describe it. I made this for my mom so I’ll be sending the results to her in the mail. Thanks for posting the photos of this, they were helpful.